The hallmark of Schistosoma mansoni infection is the formation of liver granulomas around deposited ova. The initiation of granuloma formation is T cell-dependent since granulomas are not formed in their absence. We investigated whether a few T cells arrive to initiate the inflammatory lesion and subsequently expand locally, or whether a large repertoire of systemically activated T cells home to the delayed type hypersensitivity reaction induced by the ova. The TCR repertoire of single granulomas from the same liver were analyzed by PCR using Vβ-specific primers and CDR3 analysis. Each granuloma has a very diverse TCR repertoire indicating that most of the T cells recruited to these lesions are activated systemically. At the same time, sequence analysis of individually sized CDR3 products from single granuloma indicate that a fraction of T cells expand locally at the lesion site. Using TCR transgenic mice containing a pigeon cytochrome c-specific T cell population or lymphocytic choriomeningitis virus infection tracked with lymphocytic choriomeningitis virus-specific tetramers, we demonstrated that nonspecific T cells home to the granuloma if they are activated. However, recombinase-activating gene 2−/− pigeon cytochrome c-specific TCR transgenic mice fail to form granulomas in response to S. mansoni ova even after T cell activation, suggesting a requirement for egg-specific T cells in the initiation of these inflammatory lesions. Understanding the mechanism of T cell recruitment into granulomas has important implications for the rational design of immunotherapies for granulomatous diseases. Granulomatous inflammation is a classic delayed type hypersensitivitiy reaction against particulate Ags and foreign bodies. In the case of infection by intracellular pathogens or parasites, granuloma formation is a protective host response which insulates host tissue from damaging effects of the pathogen and the inflammatory response. During chronic schistosomiasis, granulomatous responses against eggs deposited in the liver and the gut protects surrounding tissue from inflammation and egg toxicity, but can cause considerable liver fibrosis over time, leading to life-threatening portal hypertension (1). Conditions such as Crohn’s disease and sarcoidosis, where the etiological agent is unknown, underscore the severe pathology that can be associated with granulomatous inflammation. CD4+ T cells are required for the initiation, regulation, and possibly closure of granulomatous inflammation (2, 3, 4, 5). Because of this, granulomas represent a microenvironment for studying the regulation of CD4+ T cells and their requirements for protective function. T cell responses to Schistosoma mansoni in mice have been extensively studied after parasite-induced immune reactions (3, 6, 7, 8, 9). After 8 wk of infection, the liver contains a large number of mature granulomas surrounding deposited eggs. Approximately 50% of the granuloma-infiltrating cells are eosinophils, 30% are macrophages, and ∼10% are T cells. These T cells produce IL-4, IL-5, IL-6, and IL-10, and are characteristically of the TH2 phenotype during chronic infection (8, 10, 11, 12). The formation of granulomas is largely dependent upon the CD4+ T cells that represent 80% of the total infiltrating T cells (12), and in their absence the liver tissue becomes rapidly necrotic. Our approach in these studies focused on the question of how T cells initiate granuloma formation. The initial recruitment of T cells to granulomas may occur either with the arrival of limited numbers of T cells from the periphery which expand locally in response to the presence of parasite Ag, or systemically expanded T cells may localize to granulomas in a nonspecific way. It is also possible that both systemically and locally expanded T cells are present at local inflammatory lesions. Each one of these alternatives makes specific predictions about the TCR repertoire present in individual lesions which can be tested by the analysis of single granulomas (SG).3 Because ova are quite large, single liver granulomas induced by schistosome can be easily isolated free of liver tissue (11) for study by flow cytometry and RT-PCR to examine TCR repertoire usage on an individual basis. In our analysis, we observed a very heterogeneous repertoire in individual granulomas, but with substantial lesion-to-lesion variation and evidence for local clonal expansion. A related question is whether T cell specificity is important for recruitment of T cells to the granuloma. T cells homing to granulomas may be limited to those with parasite-specific TCR or may encompass a larger repertoire of T cells marked by an activated phenotype. To test whether nonschistosome-specific T cells can home to S. mansoni-induced granulomas, we used flow cytometry of granuloma-infiltrating cells to examine the homing of nonparasite-specific T cells after immunization of infected TCR transgenic mice, and after lymphocytic choriomeningitis virus (LCMV) coinfection of infected wild-type mice. Both sets of data suggested that while Ag specificity is an important determinant of granuloma localization, peripheral activation is sufficient to enable T cells of any specificity to home to local inflammatory sites. Finally, since our experiments had shown that peripheral activation allowed the entry of non-Ag-specific T cells into S. mansoni-induced granulomas, we questioned whether TCR specificity was an absolute requirement for granuloma formation. To address this question, we infected recombinase-activating gene 2 (RAG2)−/− TCR transgenic mice containing a single T cell population lacking specificity for S. mansoni Ags. Even after peripheral activation with cognate Ag, granuloma formation was absent, indicating that a large population of activated nonspecific T cells is not sufficient to induce granulomas in response to schistosome ova, and that parasite-specific T cells are essential in the initiation of granuloma formation. In these studies, we used CBA/J mice (Cumberland View Farms, Clinton, TN) and a TCR transgenic strain, AND (gift of S. Hedrick, University of California, San Diego, La Jolla, CA). B10.D2 RAG2−/− and 5C.C7/RAG2−/−(H-2k) (13) (Taconic Emerging Models Program) mice were purchased from Taconic Farms (Germantown, NY). CBA/J mice were infected s.c. at 7–8 wk of age with 35 cercariae of the Puerto Rican strain of S. mansoni (14). RAG2−/− and 5C.C7/RAG2−/− infections with the Naval Medical Research Institute strain were performed under National Institute of Allergy and Infectious Diseases contract by the Biomedical Research Institute (Rockville, MD). Infection was monitored by the presence of visible granulomas on the liver surface 8 wk after injection of cercariae. Additionally, for microscopic inspection of granulomas, pieces of liver were fixed in 10% formalin, before being imbedded in paraffin for thin sectioning (10 μm). H&E staining was done by the Histopathology Service of the Department of Pathology of University of Wisconsin (Madison, WI). LCMV-Armstrong (15) was used in these studies for infection of C57BL/6 mice previously infected with S. mansoni for 8 wk. Infection was by i.p. injection (2 × 10 5 PFU/mouse). Nine days later, mice were sacrificed and their organs isolated for study by histology and flow cytometry. Isolation of bulk granulomas has been previously described (11, 16, 17). Spleens were removed aseptically from 8- to 16-wk-old mice, and viable cells separated by centrifugation through Lympholyte M solution (Cedarlane Laboratories, Hornsby, Ontario, Canada). SGs were isolated from the preparative suspension before dispersal with collagenase under ×10 magnification using a Pasteur pipet flame-drawn to a finer tip and then processed in bullet tubes in a similar manner to bulk granulomas. RT-PCR was performed as previously described (16) using published primers for CDR3 length analysis (18). Primers were titered using positive (spleen cDNA) and negative (endothelial cell cDNA) templates. Products of these reactions were analyzed on either 1 or 2% agarose gels in 1× TBE as indicated and visualized by ethidium bromide staining. The products of the secondary CDR3 PCR were end-labeled with [γ-32P]-ATP using T4 polynucleotide kinase (NEB, Beverly, MA) by standard methods. End-labeled products were separated on 6% acrylamide 8 M urea sequencing gels alongside control samples amplified from bulk spleen RNA and visualized by autoradiography. Individual bands were cut out of dried gels and sequenced by the University of Wisconsin Biotechnology Center using the indicated Vβ primer. Splenocytes or granuloma cell suspensions were incubated for 30 min at 4°C with different labeled Abs at saturation, then washed and analyzed. Unlabeled 50 μg/ml 2.4G2 anti-FcR Ab was used to block binding of labeled Abs to FcRs. Cell surface staining on 10,000 events was measured using a FACSCalibur (BD Biosciences, Mountain View, CA) and analyzed using the CellQuest computer program (Power Macintosh version 3.0; BD Biosciences). Construction of the MHC I Db tetramers that contain the LCMV CTL epitope peptides nucleoprotein (np) 396–404 or gp33–41 has been described previously (19). For detection of LCMV-specific CD8+ T cells, single-cell suspensions from spleen or granuloma were surface stained with Abs and fluorochrome-labeled MHC I tetramer for 1 h at 4°C, followed by four-color flow cytometry. mAbs used were purified from hybridoma cell lines obtained from the American Type Culture Collection (Manassas, VA) as indicated. Hybridoma cells were cultured in HB-101 serum-free medium, and the Abs were precipitated from supernatants by 45% saturated ammonium sulfate. The purified Abs were labeled with biotin, FITC, or Cy5. Abs used included those specific for murine CD4 (GK1.5), CD44 (Pgp-1; IM 7.8.1), and L-selectin (CD62L; Mel-14). The KJ25 hybridoma specific for Vβ3 was a gift from P. Marrack (University of Colorado Heath Sciences Center, Denver, CO). Quantum Red-labeled anti-αβ TCR and PE-labeled anti-Vβ3 Abs were purchased from Sigma-Aldrich (St. Louis, MO). PE-labeled anti-murine CD8 Ab was purchased from BD PharMingen (San Diego, CA). Polystyrene latex microspheres (diameter 5 μm) were purchased from Polysciences (Warrington, PA). PCC protein (Sigma-Aldrich) was chemically attached to activated beads as previously described (20). Briefly, 2 mg of purified protein were mixed with 107 polystyrene beads in a final volume of 1 ml PBS, and incubated for 90 min at room temperature with constant tumbling. Beads were then blocked in 1.5 ml of PBS/1% BSA for 30 min. After three washes in PBS, latex beads were resuspended in PBS and stored at 4°C. We began our analysis of TCR usage in granulomas with the isolation of individual lesions from CBA/J mice infected with S. mansoni for 8 wk. Granulomas formed in chronic schistosomiasis are readily identified due to the large size of the inducing schistosome egg. Fig. 1⇓A shows the granulomatous inflammatory reaction surrounding a schistosome egg lodged in the murine liver, while Fig. 1⇓B illustrates the relative purity of a typical bulk granuloma preparation from liver assessed by flow cytometry. CD4+ T cells are around 40% of the cells in the lymphocyte gate and express an effector phenotype (L-selectinlow, CD44high). The granuloma preparation was diluted in a petri dish (the preparation is illustrated in Fig. 1⇓C), and granulomas were isolated individually under a stereoscope for analysis by RT-PCR or flow cytometry. After collagenase digestion, each granuloma yields between 2,000 and 20,000 cells. Fig. 1⇓D shows flow cytometric analysis of three SGs showing that each contains CD4+ T cells. The proportion of CD4+ T cells in each individual granuloma is similar to the bulk preparation (Fig. 1⇓B), indicating a similar recovery of CD4+ T cells from single and bulk preparations. Isolation of single liver granulomas after S. mansoni infection. A, ×100 magnification H&E-stained thin liver section of CBA/J infection at 8 wk. B, Flow cytometric analysis of bulk granuloma-infiltrating cells. The relative proportion of CD4+ and CD8+ T cells in a lymphocyte gate is shown on the left panel, while the right panel shows the activation phenotype of CD4+ gated cells stained with anti-CD44 and anti-L-selectin Abs. C, H&E-stained picture of a bulk granuloma preparation illustrating the appearance of a typical preparation used for isolation of individual granulomas under the microscope. Individual granulomas can reach 0.3 mm in diameter. 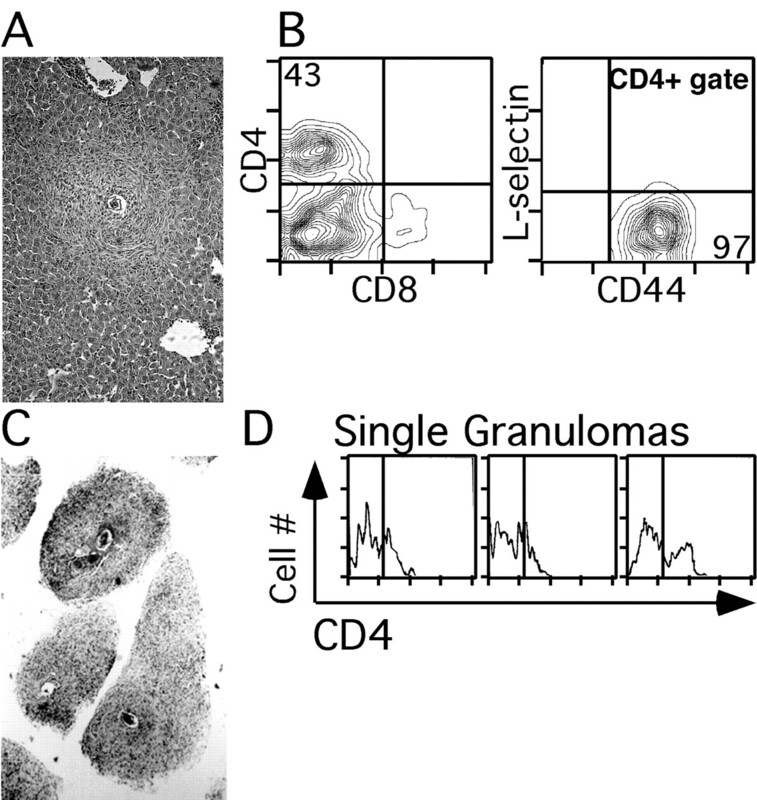 D, Flow cytometric analysis of cells isolated from three individual granulomas. Recovery is from 2,000 to 20,000 cells of which ∼10% are lymphocytes. GK1.5 staining identifies CD4+ T cells in the lymphocyte gate. Lines indicate the GK1.5-positive populations. Ten individual granulomas were prepared from a single infected mouse liver. From those granulomas, isolated mRNA was used to synthesize cDNA for RT-PCR analysis of TCR β-chain Vβ gene usage. Fig. 2⇓ shows results using primers specific for Vβ2, Vβ14, and Vβ15 in combination with a common Cβ primer, indicating that each individual granuloma contains a unique pattern of Vβ chain usage and suggesting the presence of a diverse TCR repertoire at individual sites. Similar results arose from the use of Vβ1 and Vβ4 primers (data not shown and Fig. 3⇓). Although the TCRs from the different SGs contain many similarities, they are also distinct from each other, indicating their heterogeneous nature. Secondary PCR was performed on products of the Vβ/Cβ primer-directed PCR, using 12 different Jβ gene-specific primers in combination with the indicated Vβ. Fig. 3⇓ shows the results of that analysis using Vβ1, Vβ2, Vβ4, and Vβ14 primers. Products similar to Vβ14-specific products were seen with Vβ15 (data not shown and Fig. 4⇓). Reading across the lanes for each individual granuloma can be compared with reading a “bar code” of TCR repertoire. These data clearly show that each granuloma contains a large and diverse repertoire and although there are many similarities, each granuloma has a different TCR repertoire. This argues against the presence of a few immunodominant T cell epitopes creating a T cell repertoire at the local level. Although these data do not rule out selection at individual sites by locally expressed Ags, it is clear that a large repertoire of T cells are recruited from the periphery into the individual inflammatory sites. This result excludes the hypothesis that the local expansion of a few recruited T cells is the dominant pathway of T cell accumulation in granulomas. Vβ chain gene usage in CBA/J mice infected with S. mansoni. Vβ gene segment usage in RT-PCR products from 10 individual granuloma cell preparations. The top row illustrates β-actin products as a control for equivalent levels of template. PCR products arising from Cβ-specific primer paired with Vβ2-, Vβ14-, and Vβ15-specific primers, respectively, were separated on 1.5% agarose gels and stained with ethidium bromide. Control products arising from bulk granuloma cDNA are shown on the left. Jβ gene segment usage in RT-PCR products from 10 individual SGs isolated from S. mansoni-infected CBA/J mice. Secondary PCR using 12 different Jβ-specific primers was performed using products from Vβ1, Vβ2, Vβ4, and Vβ14 + Cβ primer-specific reactions as template, and separated on 1.5% agarose gels. Each row represents products from 1 of 10 individual granulomas arrayed top to bottom, while individual primer pairs are arrayed left to right. One row can be read across horizontally as a usage bar code for an individual granuloma. CDR3 length analysis of Vβ1 + Jβ2.2 and Vβ15 + Jβ2.7 primer-specific products from individual granulomas. RT-PCR products arising from the indicated primer pairs were end-labeled with [α-32P]ATP and separated on 6% acrylamide 8 M urea sequencing gels. Autoradiography was used to visualize size variations of three nucleotide in products from different individual granulomas. Control reactions shown on the left are templated with spleen cell cDNA from a S. mansoni-infected mouse and illustrate a Gaussian size distribution of products. When secondary PCR products arising from a particular granuloma were reanalyzed on 2% agarose gels, evidence for T cell clones are seen by the differences in height, intensity, and numbers of bands (data not shown). All PCR products arising from two sets of these primer combinations (Vβ1 + Jβ2.2 and Vβ15 + Jβ2.7) were radioactively labeled with [γ-32P]ATP using T4 polynucleotide kinase and displayed on sequencing gels alongside reactions derived from uninfected spleens as controls for banding (Fig. 4⇑). The end-labeled reactions from the spleen clearly show a nonspecific or Gaussian pattern of band distribution expected from a randomly distributed pattern of untemplated nucleotide additions in the CDR3 region arising during the assembly of the V-D-J β-chain regions. In contrast, all of the reaction products from the SGs show an asymmetric banding pattern in which one or two bands strongly dominate. Differences in size and numbers of bands suggest antigenic selection for CDR3 regions of a particular size for a given Vβ/Jβ combination, while differences in band intensity of 5- to 10-fold (compare lane 19 to 18) are consistent with the local clonal expansion of individual T cell clones. To eliminate the possibility that differences in band intensity were the result of a random dilution of T cells from a broad repertoire, individual bands were cut out of the dried sequencing gels and subjected to sequence analysis using the appropriate primers. In the case of dilution, heterogeneity of joint sequences would result in unreadable sequence reactions. However, six of nine attempts yielded enough material for readable sequence (Fig. 5⇓, SG5 upper band, SG7, SG18, SG19, SG20 upper band, and SG20 lower band with the Vβ1/Jβ2.2 primer combination). All sequences obtained were clearly unique with readily identifiable V/D and D/J junctions (Fig. 5⇓). The evidence points toward clonality of a population of individual RT-PCR products and the possibility of local proliferation of parasite-specific T cells. Sequence analysis of individual-length CDR3 products. Individual bands from CDR3 length analysis of Vβ1 + Jβ2.2 products were cut out of dried acrylamide gels and sequenced in both directions using the above primers. The sequence data are aligned to illustrate Vβ1/D junctions and D/Jβ2.2 junctions. Underlined sequences in the central D region represent homology to germline sequences, while nonunderlined sequences arise from the addition of untemplated nucleotides during recombinatorial assembly. Known germline sequences for Vβ1, Dβ1, Dβ2, and Jβ2.2 are shown below for comparison. All data obtained represented unique or “clonal” sequences. We predicted that if Ag specificity plays an important role in the localization of T cells to S. mansoni-induced granulomas, then TCR transgenic mice should show an altered distribution ratio of transgenic to nontransgenic T cells between the spleen and the granuloma. We used the AND strain carrying a Vα11/Vβ3 TCR transgene specific for PCC in association with I-Ek to examine the role of Ag specificity in the granuloma. In uninfected AND mice, typically only 2–5% of T cells bear nontransgenic TCR arising from incomplete allelic exclusion. Upon infection, the proportion of nontransgenic (Vβ3-negative) cells in the spleen and periphery rises to 15–30% (Fig. 6⇓A, upper plot). Thus, the nontransgenic T cells likely expand under antigenic pressure, while the transgenic TCR marks the nonspecific population. Neither schistosome eggs nor schistosomal egg Ag (SEA) activate transgenic cells for in vitro proliferation (data not shown). Granuloma lymphocytes show a substantial increase in the ratio of nontransgenic (Vβ3-negative) to transgenic cells (Vβ3-positive), implying that there is an active selection against transgenic cells in the granuloma T cell population (Fig. 6⇓A, lower plot). In addition, gating of the granuloma cells on Vβ3-positive and -negative populations shows that the activation stages of the two populations are very different. A significant proportion of the Vβ3-positive population exhibits a resting or virgin phenotype (Fig. 6⇓B, upper plot), while almost all of the nontransgenic population displays an L-selectinlow, CD44high phenotype characteristic of activated T cells (Fig. 6⇓B, lower plot). Granuloma-infiltrating CD4+ T cells from wild-type mice do not express a CD44low, L-selectinhigh phenotype (Fig. 1⇑B, right panel). It is likely that in wild-type mice, small numbers of naive T cells enter granulomatous inflammatory sites, but are rapidly activated so that a naive phenotype is not normally detected among granuloma-infiltrating cells. In situations where nonactivated T cells are in excess, naive T cells may enter granulomas without becoming activated (21, 22). Flow cytometric analysis of S. mansoni infection of TCR transgenic mice specific for PCC. AND mice containing a Vα11/Vβ3 transgene were infected with S. mansoni for 10 wk. A, Flow cytometric profiles of Vβ3 TCR+ vs αβ TCR+ in splenocytes (top panel) and granuloma cell preparations (bottom panel) after lymphocyte gating. B, Expression of activation markers on Vβ3+ transgenic (top panel) vs Vβ3− nontransgenic (bottom panel) populations in the granuloma infiltrating cells. Dot plots show L-selectin and CD44 expression for the indicated populations from a lymphocyte gate. C, Flow cytometric profiles of Vα11 TCR+ vs αβ TCR+ in unmanipulated animals (top panel) and in animals immunized before infection with PCC-coated latex beads (bottom panel) after lymphocyte gating of granuloma cell preparations. 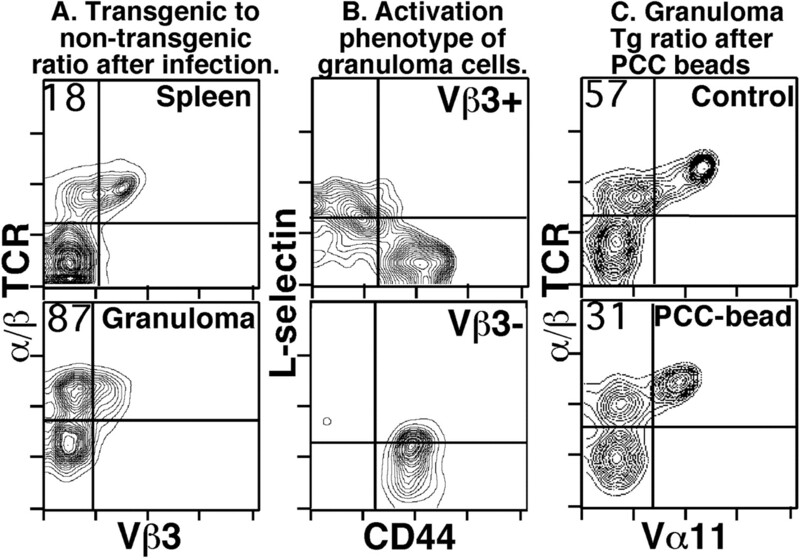 A and C, The values shown in the upper left of the plots represent the nontransgenic percentage of T cells, i.e., the Vβ3-negative (A) or Vα11-negative (C) fraction of total αβ TCR-positive events. Having observed that nontransgenic parasite-specific T cell with an activated phenotype preferentially accumulate in granulomas, we addressed the question of whether immunization can alter the selection of Ag-specific cells in the granuloma. AND mice were immunized with PCC-coated beads before infection and the ratio of transgenic (Vα11-positive) to nontransgenic (Vα11-negative) T cells in spleen and granuloma was compared. Noninfected animals show significantly depleted numbers of transgenic T cells in the spleen demonstrating that activation was effective and led to the elimination of part of the population through apoptosis (data not shown). In the granuloma, PCC bead-immunized animals have greater numbers of transgenic T cells (Vα11-positive) present after systemic activation (Fig. 6⇑C, compare upper and lower plots). Thus, specific immunization can promote the homing of nonschistosome-specific T cells to granulomas and alter distribution of T cells at local inflammatory sites. To track the homing of peripherally activated nonlocal Ag-specific T cells in a non-TCR transgenic model, C57BL/6 mice chronically infected with S. mansoni were coinfected with LCMV-Armstrong 9 days before sacrifice of animals and organ harvest. As expected, LCMV infection induced a significant expansion of LCMV-specific CD8+ T cells in the periphery (19). Fig. 7⇓ shows the CD4+ to CD8+ T cell ratio after flow cytometric analysis of splenocytes and granuloma-infiltrating cells from either control infections or LCMV coinfections. In splenocytes from schistosome-infected mice, the ratio is 2:1, increasing to >3:1 in the S. mansoni-induced granuloma. In LCMV coinfected animals, the relative proportion of CD8+ T cells rises among splenocytes in response to infection similar to the rise seen during control LCMV infections (19). The granuloma-infiltrating cells from those LCMV-infected animals contain five times more CD8+ T cells proportionately, outnumbering CD4+ T cells 4:1. H&E-stained thin liver sections show large, well-formed granulomas similar to those seen in control infections (data not shown). This result indicates that activation of T cells in the periphery can induce their localization to granulomas. The CD4+ T cell predominance in schistosome granulomas may reflect the dominance of CD4+ T cells among the activated T cells after S. mansoni infection. MHC class I tetramers specific for CD8+ T cells recognizing a dominant LCMV epitope np396–404 were used to further characterize the Ag specificity of CD8+ T cell-gated granuloma-infiltrating cells. After LCMV superinfection, 8.5% of the CD8+ T cells were np396 tetramer+ and LFA-1+, indicating that LCMV-specific T cells are recruited to S. mansoni-induced granulomas. This model also completely underscores that peripheral activation of non-Ag-specific T cells is sufficient to redirect their localization to the granulomatous inflammatory site irrespective of their TCR specificity. Furthermore, the influx of CD8+ T cells into a granuloma normally dominated by CD4+ T cells did not result in compromised granuloma structure at the level of histopathology. Virus-specific T cells can be recruited to S. mansoni-induced granuloma following coinfection with LCMV. S. mansoni-infected C57BL/6 mice were infected with LCMV-Armstrong at 8 wk. Nine days later, mice were sacrificed and spleens and livers removed for analysis. Flow cytometric dot plots illustrate the significant alteration in the overall composition and TCR specificity of the granuloma infiltrating cells after coinfection. Plots shown on the left illustrate CD4- and CD8-specific Ab staining of gated lymphocytes, while the right panels illustrate LFA-1 Ab and class I Db/np396 tetramer staining of CD8+-gated lymphocytes. Similar results were observed with tetramers containing the gp33 peptide (data not shown). Because immunization with specific Ag was sufficient to direct the localization of non-Ag-specific T cells to the granuloma, we wondered whether a single TCR without specificity for S. mansoni might be sufficient for protective granuloma formation or whether the diversity of the T cell population characterized in the TCR repertoire analysis is required. 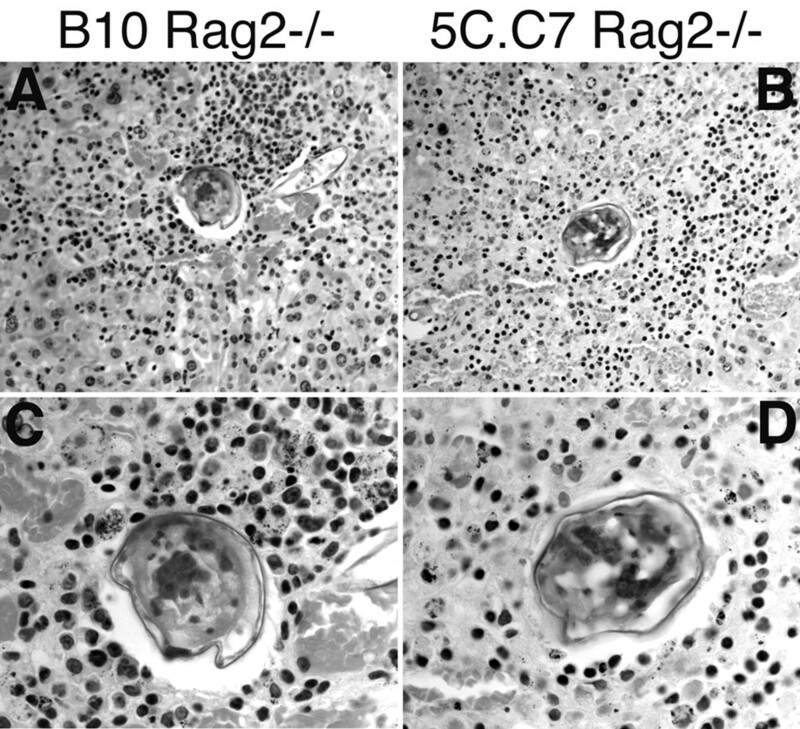 Infection of B10.D2 RAG2−/− mice with S. mansoni did not result in protective granuloma formation and animals died at around 9 wk postexposure (Fig. 8⇓, A and C). Likewise, granulomas were not formed in 5C.C7/RAG2−/− mice bearing a single TCR specific for PCC after infection with S. mansoni (data not shown). Systemic activation of 5C.C7 RAG2−/− mice by s.c. injection of 100 μg PCC in CFA 7 wk after infection had no protective effect either (Fig. 8⇓, B and D). The presence of a large population of monoclonal activated T cells not specific for schistosome ova is not sufficient for granuloma formation. It is possible that a heterogeneous T cell population is required to induce granulomas; however, it is more likely that T cells specific for local ova-specific Ags are needed for granuloma formation. Absence of S. mansoni-induced liver granuloma formation in Rag2−/− mice with or without a single TCR. H&E-stained thin liver section of S. mansoni infection (strain NMRI). B10.D2 Rag2−/− at 63 days of infection (A and C) and 5C.C7/Rag2−/− at 60 days of infection (B and D) are shown. The 5C.C7/Rag2−/− mouse was injected s.c. with 100 μg PCC at day 49. Liver tissue specimens were removed from animals dead <6 h. Fields at a total magnification of ×400 (A and B) illustrate the lack of an organized granuloma structure around the S. mansoni egg, while the fields at a total magnification of ×1000 under oil (C and D) illustrate the nature of the cellular response immediately adjacent to the same egg. S. mansoni-induced granuloma formation and its regulation presents a complex and sophisticated picture. Several lines of evidence have indicated the essential role of CD4+ T cells in granuloma formation, including infection of SCID and MHC class II-deficient mice (3, 23, 24), and depletion of CD4+ T cells after infection (2). T cells in granulomas regulate and are regulated by a carefully balanced cytokine milieu (25) containing many layers of redundancy (12, 26). An initially Th1-type reaction promoting a vigorous granulomatous response gives way under the influence of IL-6 and IL-10 to a Th2-type response during the chronic phase of the reaction (27, 28, 29). Several immunodominant T cell epitopes have been identified which elicit significant IFN-γ production (30, 31). One of the functions of IFN-γ may be to enhance the role of IL-12 in discriminating between Th1 and Th2 subset development (27, 32). Among the Th2 type cytokines, IL-4 (33), IL-13 (9, 34), and IL-5 each have distinct and important roles. T cells are required, not only for the host reaction but also for parasite development (35). Although cytokine regulation in schistosome granulomas is a well-established model of local cytokine circuits, much less is known about the role of TCR specificity in the recruitment of T cells into granulomas. Our interest in granuloma formation and regulation focuses upon requirements for T cell Ag specificity. Our data simultaneously demonstrate both the diverse and heterogeneous nature of the TCR on granuloma-infiltrating cells in response to S. mansoni infection and the capacity of those cells to clonally expand locally in response to parasite Ag. Several explanations for the diversity of the TCR repertoire can be given. Despite the probable existence of an immunodominant S. mansoni epitope to which some cells expand locally, many other parasite-specific Ags may be present at the chronic stage in the granuloma. Alternatively, a single dominant Ag could invoke a response by T cells with diverse TCRs. Finally, genetic variation of the uncloned parasite might lead to epitope differences at the granuloma level. The evidence for Ag specificity as a requirement for T cell localization to the granuloma lies in the unique nature of the TCR repertoire in each granuloma both at the level of Vβ and Jβ chain usage (Figs. 2⇑ and 3⇑), and at the CDR3 length level (Fig. 4⇑). Previous analysis of the TCR repertoire in the spleen of schistosome-infected CBA/J mice had not detected any superantigen type shifts in TCR usage of Vβ4, Vβ8.2, or Vβ14 TCR-β chains using flow cytometry with Vβ-specific Abs (10), and we have extended this analysis to the bulk and SG level. The unique sequences arising from individual size CDR3 bands and differences in their relative abundance (Fig. 5⇑) suggest local proliferative capacity. This is powerfully reinforced by infection of AND TCR transgenic mice in which parasite-specific nontransgenic cells are preferentially localized to the site of inflammation (Fig. 6⇑A) where they have a highly activated phenotype (Fig. 6⇑B). This is similar to work showing local expansion at the inflammatory site in sarcoidosis (36), and a highly activated and proliferative phenotype (IL-2R-positive) of T cells within human periapical granulomas (37) and Leishmania panamensis-induced granulomas (38). At the same time, the TCR repertoire present in individual lesions and in the population of lesions throughout the liver is demonstrably very heterogeneous. We cannot exclude the possibility that a fraction of that heterogeneity arises from temporal alterations in Ag availability arising from the nonsynchronized nature of the granulomas isolated and the genetic heterogeneity of the S. mansoni parasites. As a technical matter, one tends to pick the largest lesions out of the pool under the microscope, and they may be somewhat synchronized. Another fraction of the heterogeneity likely arises from the presence of non-Ag-specific T cells unresponsive to SEA or other parasite egg Ags. Our infection of AND mice suggests that the nonparasite-specific component is composed of both activated and nonactivated T cells (Fig. 6⇑B). We also observed that systemic activation of T cells by a nonparasite Ag promotes their localization to granulomatous lesions (Fig. 6⇑C). This was consistent with previous observations of the development of SEA-reactive lymphocytes in the spleen before their detection in granuloma-infiltrating cells (39). Phillips and coworkers (40) have also shown that activated cells home to granulomas, although they did not address the role of Ag specificity. Both groups found that splenic lymphocytes have a higher proliferative capacity, suggesting that both systemic expansion and activation play a role in the recruitment of lymphocytes to granulomatous sites (39, 40). Although there is clearly a strong role for dominant local Ags, and T cells responsive to those Ags are significantly more than a minority of the T cells present, nonparasite-specific T cells are also readily found in the granuloma. Several mechanisms are likely operative. On the one hand, Ag-specific retention, survival, and local expansion ensures the availability of parasite reactive T cells in the lesion. This is supplemented by populations of T cells recruited independently of Ag specificity. Those will include systemically activated nonparasite-specific T cells, random traffic of naive T cell populations, random and nonrandom traffic of regulatory T cells contributing to pathogenesis, lymphokine-induced traffic of T cells, and T cell populations activated by non-TCR-mediated mechanisms or by bystander activation via parasite-specific T cells. The work of Stadecker and colleagues (22) has shown that a single Th1 cell clone specific for SEA can induce granuloma formation in response to embolized eggs after transfer into non-RAG hosts and that single altered peptide epitopes can down-regulate granuloma formation (31). We systemically activated single Ag-specific T cells lacking parasite specificity to test whether an abundant systemically activated monoclonal T cell population that does not react with the parasite can induce or fail to induce granulomas. Our data indicate that T cells recognizing local parasitic Ags are required for initiating granulomas. Activated nonschistosome-specific T cells home to schistosome-induced granulomas in AND mice (Fig. 6⇑), but alone are not sufficient to induce typical lesions around the schistosome ova (Fig. 8⇑). The requirement for a single Ag specificity is currently being studied in our laboratory using RAG-deficient hosts. Although skews in the repertoire at local inflammatory sites have been repeatedly reported, definitive conclusions have been hard to draw (reviewed in Ref. 41). On the one hand, Ag-specific T cells may dominate locally. Systemic and local Ag leads to activation and expansion of parasite-specific T cells (39, 40) which home to the granuloma and are preferentially retained and expanded. This model is supported by data showing that SEA-reactive lymphocytes are recruited to granulomas in vivo (42) and by in vivo identification of immunodominant T cell epitopes from SEA (30). An alternative model derives from the work of Steinman (43) on autoimmunity. In this scenario, a minor population of parasite-specific T cells are activated and expand at the inflammatory site where they control a much larger randomly recruited nonspecific infiltrate. The existence of non-Ag-specific lymphocytes in the granuloma is indicated by the finding that SEA induces a large fraction, but not all, of the IL-5, IL-10, or IFN-γ response from granuloma-infiltrating cells in vitro assessed by the comparison of SEA stimulation vs anti-CD3 stimulation (44). Recent studies have also suggested that highly homogeneous populations of eosinophils in the granuloma are primarily responsible for production of the granuloma cytokine microenvironment (26). Our data argue most convincingly for a broadly based T cell expansion from outside the local inflammatory site and a broad array of selecting Ags in the granuloma. Local expansion cannot account for all the heterogeneity; T cells must be systemically activated and recruited. At the same time, our data do also show clear evidence for local expansion. The finding that systemic activation can promote accumulation of nonparasite-specific T cells in granulomas (Figs. 6⇑ and 7⇑) provides clues for modulating granulomatous diseases. Our results suggest that it may be feasible to induce anti-inflammatory T cells to home to granulomas (i.e., IL-10 producing regulatory T cells). Interestingly, in granulomatous lesions the ratio of accumulated CD4+ and CD8+ T cells is very consistent and characteristic for different granuloma-inducing agents. In S. mansoni-induced granulomas the CD4+:CD8+ ratio is 3–10:1, in Leishmania chagasi the CD4+:CD8+ ratio is 3–7:1 (45), and in mycobacterial granulomas the CD4+:CD8+ ratio is 1:1 (46). These differences may reflect the different spectrum of chemokines induced by these agents (47, 48). However, it is also likely that during chronic infection, the ratio of activated CD4+:CD8+ T cells is skewed and the composition of the granuloma T cell repertoire reflects that systemic ratio. This is supported by our LCMV coinfection experiments (Fig. 7⇑). LCMV induces a strong CD8+ T cell expansion. Coinfection by LCMV of S. mansoni-infected mice resulted in the transient appearance of a CD8+ T cell-dominated S. mansoni granuloma. Further studies of coinfections will be necessary to see how different infections interfere with granulomatous responses. In this report, we showed that SGs contain extensive and varied TCR repertoires that differ from granuloma to granuloma. A small fraction of T cells expand locally, but overall, peripheral T cell activation is the major factor defining the granuloma T cell repertoire. Our ability to change the TCR repertoire in granulomas by changing the peripheral T cell repertoire through immunization or coinfection (Figs. 6⇑ and 7⇑) indicates that systemic manipulation can regulate local inflammatory regions. Additionally, T cells that are not specific for local Ags accumulate in granulomas, but lesion formation requires local parasite-specific T cells. The implications of our data have important consequences both for understanding autoimmunity as modeled by granulomatous lesions and for design of rational immunotherapies to treat chronic granulomatous diseases in which Ag is present for extended periods of time. We thank Satoshi Kinoshita for his expert histopathology services, Khen Macvilay for flow cytometry services, Art Blum for assistance with the S. mansoni SG isolations, and Dr. Fred Lewis of the Biomedical Research Institute for performing S. mansoni infections. ↵1 This work was supported by an R01 Award (AI 48087-01) from the National Institute of Health, an American Lung Association Award, and gift monies from the University of Wisconsin Comprehensive Cancer Center (to M.S.). ↵3 Abbreviations used in this paper: SG, single granuloma; LCMV, lymphocytic choriomeningitis virus; PCC, pigeon cytochrome c; RAG2, recombinase-activating gene 2; SEA, schistosomal egg Ag; np, nucleoprotein.